Feedback: Ellis Heating & Air Inc. Nothing makes us happier than a satisfied customer. Here’s what a few had to say about their experience with Ellis Heating & Air. I have used other local companies in the past for my HVAC service, but have been disappointed by their level of service. I came home from work had no AC and made a call at 9:00PM and we were back in business within an hour. I will NEVER call anyone else but ellis for service. FIRST CLASS all the way! 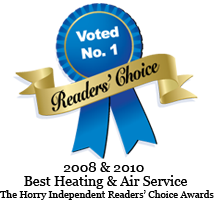 I was new to Conway and Ellis Heating and Cooling was recommended to me along with several others. After meeting with about 5 different companies I selected Ellis to install my system. They were always on time. Communicated clearly and had good ideas on how to install a new system in an old home. I would highly recommend them to anyone. Thank you for a job well done! Excellent service with friendly and professional attitude. If you want it fixed right the first time...give them a call. Great work, professional quality service! Don't use any body else! !